The planet Tau Boötis b  was one of the first exoplanets to be discovered back in 1996, and it is still one of the closest exoplanets known. Although its parent star is easily visible with the naked eye, the planet itself certainly is not, and up to now it could only be detected by its gravitational effects on the star. Tau Boötis b is a large “hot Jupiter” planet orbiting very close to its parent star. Like most exoplanets, this planet does not transit the disc of its star (like the recent transit of Venus). Up to now such transits were essential to allow the study of hot Jupiter atmospheres: when a planet passes in front of its star it imprints the properties of the atmosphere onto the starlight. As no starlight shines through Tau Boötis b’s atmosphere towards us, this means the planet’s atmosphere could not be studied before. 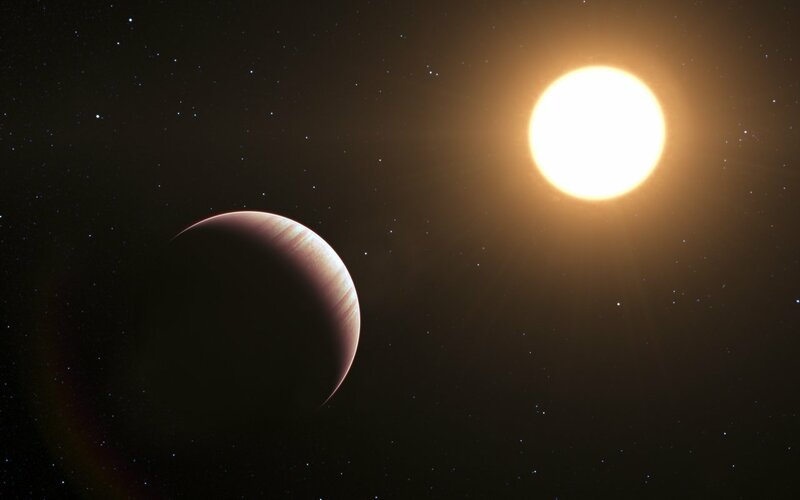 But now, after 15 years of attempting to study the faint glow that is emitted from hot Jupiter exoplanets, astronomers have finally succeeded in reliably probing the structure of the atmosphere of Tau Boötis b and deducing its mass accurately for the first time. The team used the CRIRES  instrument on the Very Large Telescope (VLT) at ESO’s Paranal Observatory in Chile. They combined high quality infrared observations (at wavelengths around 2.3 microns)  with a clever new trick to tease out the weak signal of the planet from the much stronger one from the parent star . Lead author of the study Matteo Brogi (Leiden Observatory, the Netherlands) explains: “Thanks to the high quality observations provided by the VLT and CRIRES we were able to study the spectrum of the system in much more detail than has been possible before. 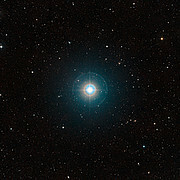 Only about 0.01% of the light we see comes from the planet, and the rest from the star, so this was not easy”. The majority of planets around other stars were discovered by their gravitational effects on their parent stars, which limits the information that can be gleaned about their mass: they only allow a lower limit to be calculated for a planet’s mass . The new technique pioneered here is much more powerful. Seeing the planet’s light directly has allowed the astronomers to measure the angle of the planet’s orbit and hence work out its mass precisely. By tracing the changes in the planet’s motion as it orbits its star, the team has determined reliably for the first time that Tau Boötis b orbits its host star at an angle of 44 degrees and has a mass six times that of the planet Jupiter in our own Solar System. As well as detecting the glow of the atmosphere and measuring Tau Boötis b’s mass, the team has probed its atmosphere and measured the amount of carbon monoxide present, as well as the temperature at different altitudes by means of a comparison between the observations and theoretical models. A surprising result from this work was that the new observations indicated an atmosphere with a temperature that falls higher up. This result is the exact opposite of the temperature inversion — an increase in temperature with height — found for other hot Jupiter exoplanets  . The VLT observations show that high resolution spectroscopy from ground-based telescopes is a valuable tool for a detailed analysis of non-transiting exoplanets’ atmospheres. The detection of different molecules in future will allow astronomers to learn more about the planet’s atmospheric conditions. By making measurements along the planet’s orbit, astronomers may even be able to track atmospheric changes between the planet’s morning and evening. "This study shows the enormous potential of current and future ground-based telescopes, such as the E-ELT. Maybe one day we may even find evidence for biological activity on Earth-like planets in this way”, concludes Ignas Snellen. 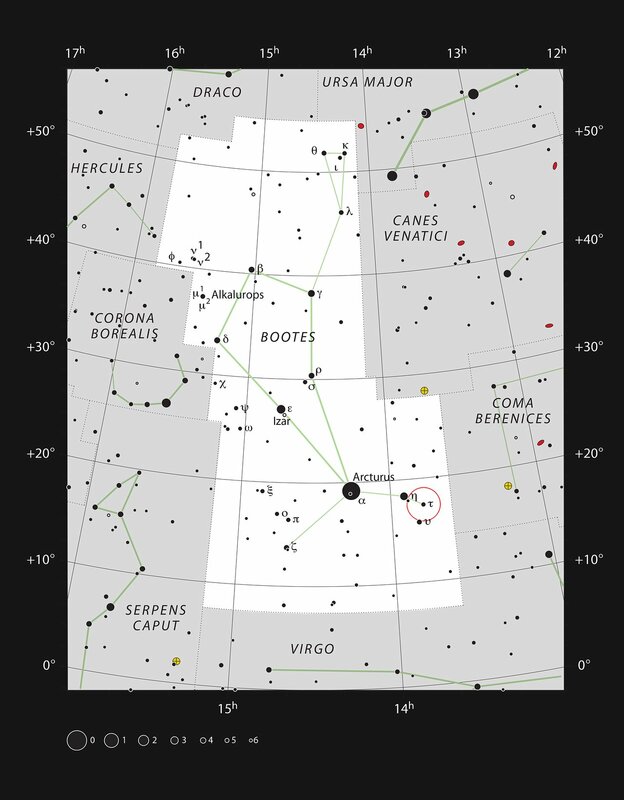 The name of the planet, Tau Boötis b, combines the name of the star (Tau Boötis, or τ Bootis, τ is the Greek letter “tau”, not a letter “t” ) with the letter “b” indicating that this is the first planet found around this star. 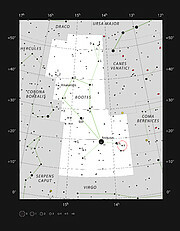 The designation Tau Boötis a is used for the star itself. At infrared wavelengths, the parent star emits less light than in the optical regime, so this is a wavelength regime favorable for separating out the dim planet’s signal. This method uses the velocity of the planet in orbit around its parent star to distinguish its radiation from that of the star and also from features coming from the Earth’s atmosphere. The same team of astronomers tested this technique before on a transiting planet, measuring its orbital velocity during its crossing of the stellar disc. This is because the tilt of the orbit is normally unknown. If the planet’s orbit is tilted relative to the line of sight between Earth and the star then a more massive planet causes the same observed back and forth motion of the star as a lighter planet in a less tilted orbit and it is not possible to separate the two effects. Thermal inversions are thought to be characterised by molecular features in emission in the spectrum, rather than in absorption, as interpreted from photometric observations of hot Jupiters with the Spitzer Space Telescope. The exoplanet HD209458b is the best-studied example of thermal inversions in the exoplanet atmospheres. This observation supports models in which strong ultraviolet emission associated to chromospheric activity — similar to the one exhibited by the host star of Tau Boötis b — is responsible for the inhibition of the thermal inversion. This research was presented in a paper "The signature of orbital motion from the dayside of the planet τ Boötis b" to appear in the journal Nature on 28 June 2012. The team is composed of Matteo Brogi (Leiden Observatory, the Netherlands), Ignas A. G. Snellen (Leiden Observatory), Remco J. de Kok (SRON, Utrecht, the Netherlands), Simon Albrecht (Massachusetts Institute of Technology, Cambridge, USA), Jayne Birkby (Leiden Observatory) and Ernst J. W. de Mooij (University of Toronto, Canada; Leiden Observatory).